An adjustable metering system and Independent roller speed controls allow the operator to adjust coating thickness with ease. The user4rlendiy coating & wash system provides for an easy switch from one coating finish to another within minutes. 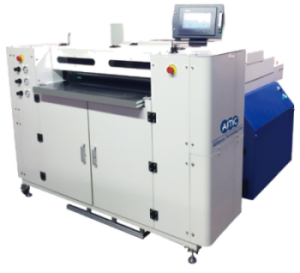 The ATC UV.36SD Cyclone coating technology Is Ideal for protecting and enhancing output materials from digital and photo printers. off.set press and litho press. This ATC coating system can coat substrates such as styrene, chioroplast. corrugated materials, foam board, metal, and other printable media up to a thickness of 1 Inch (2.54cm). Length: 85W (216cm) in operational configuration.